Copiers are found on the first, second, third, and fourth floors of the John C. Hitt Library, with the second floor having the highest concentration of machines. The Rosen Library offers one black & white printer and one color printer, both of which are located in the center of the library. A black & white photocopier is available in the Rosen Library near the KnightCash machine. For assistance with scanning, please see a library staff member at the front desk. 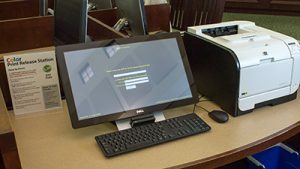 Scanners are located at two computer workstations in the Rosen Library and are available to use at no cost. Located next to the photocopier and Knight Cash machine. The Curriculum Materials Center has a color printer and a black and white printer. Both are located at the bank of computers by the Service Desk. The Curriculum Materials Center has a copier located by the entryway. The Curriculum Materials Center has a KIC Book Scan Station by the entryway and two document/flatbed combination scanners located by the bank of computers near Biography shelving.